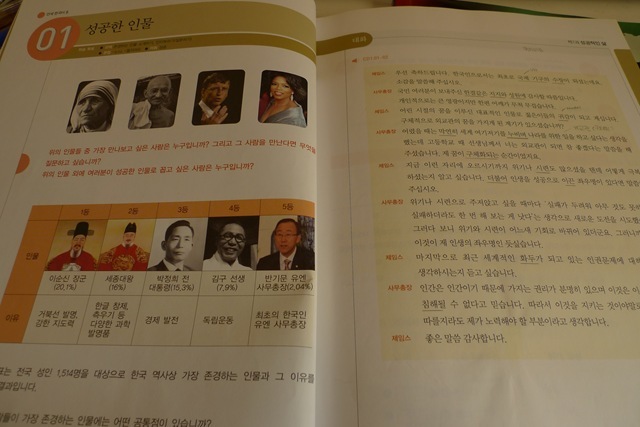 This textbook means alot to me since it’s the books that I’ve used in the Yonsei classes in Korea. There are 6 levels altogether and each level is split into 2 books (+2CDs). For the lower levels (1-3 i believe), the book comes in different versions: Chinese, Japanese, English etc. However, for the higher levels, only the Korean versions are available (I believe). I used Level 6 for my classes and hence, I’ll review it ^^ I don’t have the rest of the levels, although I’m tempted to get level 5 also. My teachers told us that level 5 introduces alot of technical vocabulary, which is good for those who want to expand their vocabularies! Go under the cut for the full review! p.s. for those who don’t want to read my lengthy rant, there’s a succinct summary right at the end! Each chapter revolves around a specific topic, eg. Environment, Globalisation. Chapters begin with a dialogue, followed by exercises that introduces vocabulary/expressions related to that topic. This is followed by new grammar points, whose detailed illustrations are found at the back of each chapter. The exercises aim to help you get familiar with the usage of the constructions. Related readings are further exercises are also included at the back. I used to think that with effort, self studying is also as effective. But the Yonsei classes changed my thinking. Having good teachers who will offer you extra details and more sample sentences can help alot. I can feel the difference: using the book in classes VS self studying now. answers to exercises are not provided. If you have any specific questions on the book, feel free to leave a comment! 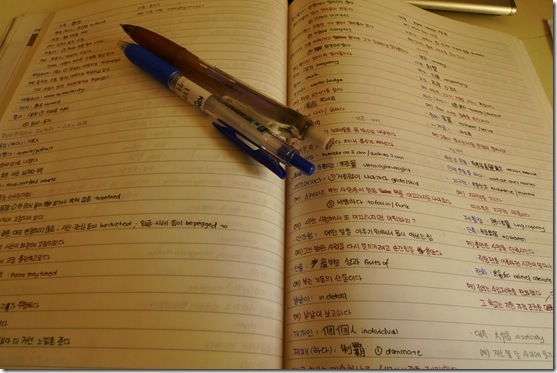 If you have used the Yonsei books before, let me know what you think of them! thank you for the great review. 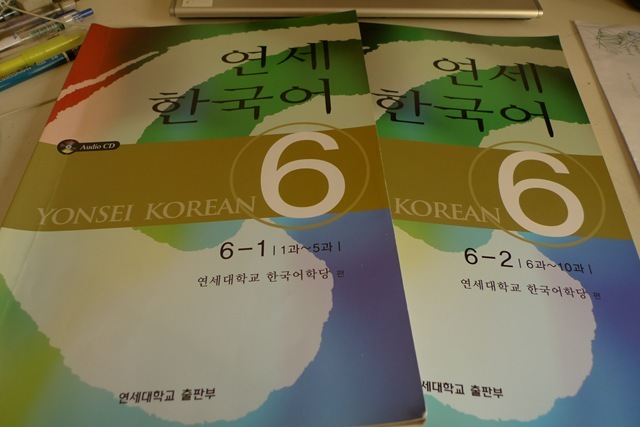 I really want to get 5급 and 6급, I couldn’t wait to get my hands on those books. I’m worried about “the no answers are provided” but maybe i can work that out. I think basic korean to a certain level can be self-attainable. Having classes is okay but I don’t think grasping the basics should be learned in class. I think having classes is fun since you attained a high level of fluency already, you can express yourself more and understand more. Learning technical terms is not that hard for you. the ‘no answers provided’ pose quite abit of problem for self learners like us ): i miss the times that the teacher will go through them with us. Taking korean classes at a high level is fun due to all the stimulating discussions/debates that we have. It makes learning so much more interactive and new knowledge is readily absorbed. Thanks for the review here. I’m using Integrated Korean. I guess it’s not targeted at self-learners too, as no answers were provided. But I still enjoy studying the textbook! 🙂 Looking forward to your next review! Actually I will have to disagree^^ Before going for exchange in Korea (I did Fall2012/Spring2013 at Ajou University) I studied by myself by using Complete Korean and occasionally Rosetta Stone (I know crappy choice) and to be honest I realised how unfortunate it was when I started taking classes during my exchange, I skipped to 2nd level straight away since I already knew basic stuff like reading and basic grammar but I could barely understand what teacher is saying because during my studies I haven’t heard native pronunciation (I wasn’t into watching dramas which of course was a big mistake of mine, but I just couldn’t bring myself to watch them) so like it was a very silly situation cuz my speech was around pre-intermediate but my listening was so underdeveloped that I couldn’t utilize my speech cuz I wouldn’t understand what people are asking me. 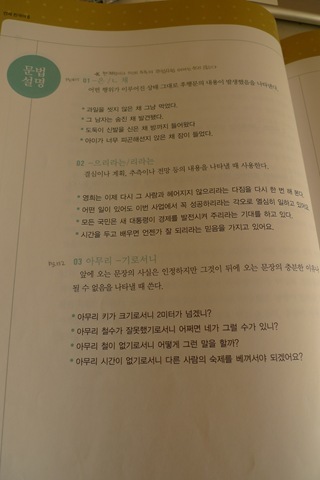 May i know if i can find the Yonsei textbook for beginner in Singapore?? or online?? contents aside, the structure is actually similar to the ones by Kyung Hee. 말하기/ 듣기, 쓰기, 분법, 어휘. and i agree, both series are not very good for self-learners of higher levels due to the lack of explanation in another language. KLEAR is good for self-studies (as you have recommended! =D)! Thanks. I’ve seen reviews before for Integrated Korean and Elementary/Continuing Korean, but not for the Yonsei series. hhhaah. i have that grammar book too! 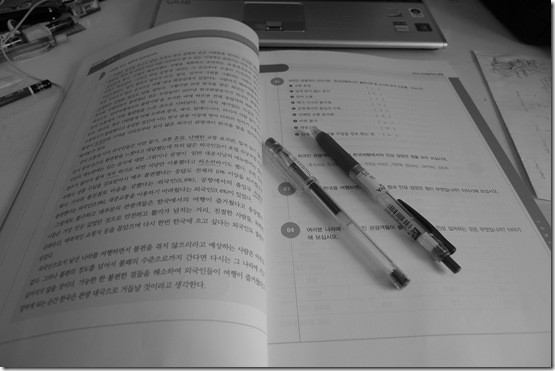 I think that Yonsei Books are the best books to study with. I myself have never purchased one but hopefully I will one day. I’ve seen previews of them and I want them so badly especially the 연세 한국어 읽이 series. 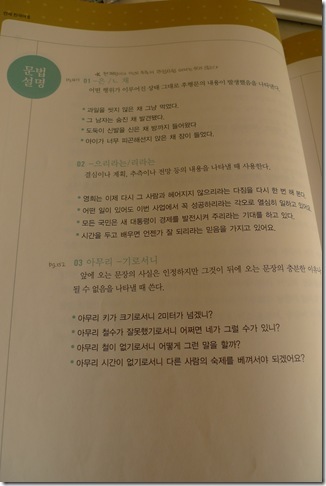 Where do you buy your Yonsei books? I don’t know where you live (since you didn’t specify), but Hanbooks.com sells Korean textbooks (including the Yonsei series). They are based in California (US), so the site is completely in English, and the site says they ship internationally. I have bought books from them before, but I’m in the US, so I can’t vouch for the international shipping part. Have you seen the earlier levels of this book? Does it also have the same format? I really like the format of this book. And I think the quality of the book is really good. I want to buy that book but I already have tons of Korean books that I’m taking for granted. Oh well! I think I need to finish my books first. I was wondering if you could tell me approximately what Yonsei books are equal to which integrated Korean books? What is the ISBN of Yonsei Korean Reading 6 ? 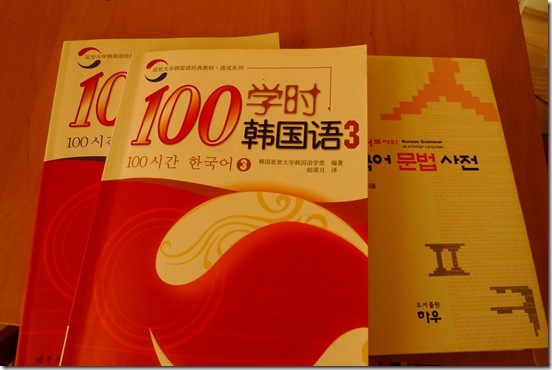 I wonder which series is better for self-learners, the one from Ganada or Yonsei. These 2 seem to be the most popular series among Japanese bloggers. 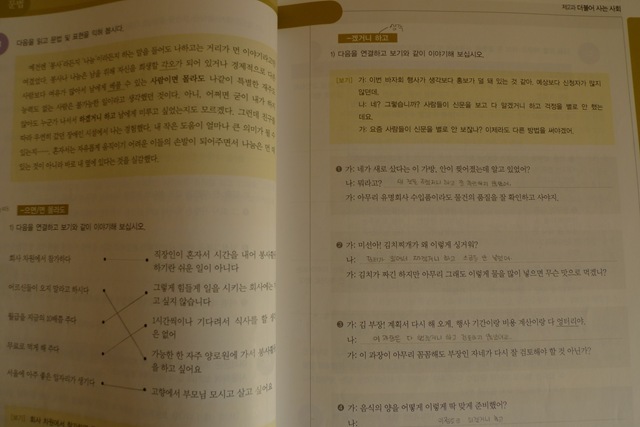 Do you have any idea where I can buy the textbooks online and get them to be mailed to my address outside of South Korea? I had the shock of my life when I realized that they cost 117 Singapore dollars in Singapore! hmm, for the yonsei book…im planning to buy one but i’m just wondering what type of paper the book uses. Please tell me that the pages inside aren’t like photography paper T.T it makes me cringe..